I fell for Slovenia the moment our car arrived at our apartment in the resort town of Bled. Famished, I headed straight for the cafe at the apartment block. One dessert drew me in - it was simply called the cream cake. The first mouthful of that delightfully light confection was unexpectedly delicious; and that is exactly how this charming country impressed me. It may look simple on the outside, but once you explore its inner beauty, you are left with unforgettable memories. It lies nestled between the Alps and the Adriatic Sea, south of Austria. Slovenia, one of the smallest countries in Europe, (but, at about 20,000 sq km, about 29 times the size of Singapore) is full of curious traditions and diverse nature. Opportunities to explore nature are abundant. Slovenia was the first country to be declared a green destination by Green Destinations, a Netherlands-based non-profit organisation for sustainable tourism, and its capital city Ljubljana (pronounced loo-bliyana) was awarded the European Green Capital 2016 title. My first look at Slovenia's storybook scenery was at Lake Bled. As I stood there in the misty morning, dumbfounded by what looked like a fairytale setting, I realised why this lake is the most photographed by visitors to Slovenia. 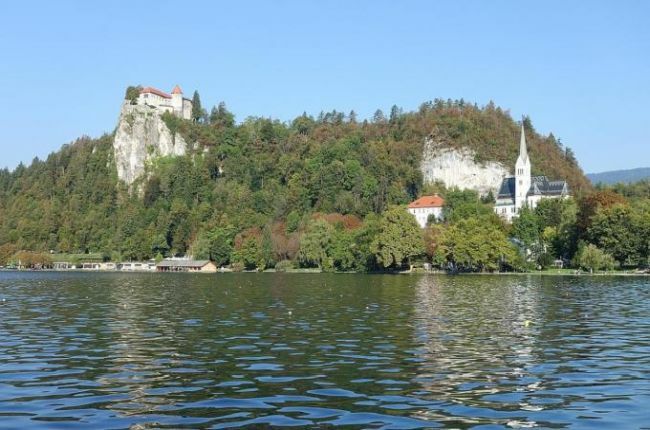 Lake Bled is a glacial lake and its water source is the many hot springs from the mountains surrounding it. But more special is the Pilgrimage Church of the Assumption of Maria, located right in the middle of the lake on a small island that can be reached by traditional boats called Pletnas. Another awe-inspiring structure, spectacularly perched on a cliff more than 130m above the lake, is Bled Castle. Every detail of Slovenia's oldest castle screams medieval fortress, including the Gothic arch at its entrance. My love for architecture also led me to the small old town of Radovljica. Just 10 minutes by bus from Lake Bled, its historical richness makes it a must-visit. You feel like you've stepped into a bygone era; structures and buildings dating back to the 14th and 15th century characterise the town square. You can find entirely preserved Gothic and Renaissance buildings and the only moat in Slovenia that dates back to the 1500s. One of the town's attractions is the Church of St Peter with its towering vaults and black marble altar. Another of Slovenia's charms is Triglav National Park, in the centre of Triglav, the highest mountain (with an elevation of 2,863m) in Slovenia. Making our way there was a thrill in itself, via a very cool train that carried cars through the mountains. We began our hike through the park to reach vantage points where we could marvel at the Julian Alps, Vintgar Gorge and Soca River. My favourite part of the trail was walking on rustic wooden bridges above the Soca River and into a canyon, to find the 15m-high Kozjak Waterfall at the end. It is hidden inside a cave-like area, with its crystal-clear waters plunging into the amazingly green Soca River below. Slovenia also boasts many stunning caves that are easily accessible. While the most popular one is the world-renowned Postojna Cave, I chose to explore Skocjan Cave due to time constraints. It is easily the most impressive cave I have been to and the trail across its bridges led us to more than 20 underground waterfalls and towering stalactites and stalagmites. Skocjan also has the largest underground canyon in Europe and is a Unesco World Heritage site. If all you know of Slovenia is Melania Trump, perhaps it's high time to discover the spectacular national treasures and simple beauty that make the US First Lady's birth country a holiday destination that will leave a profound impression.